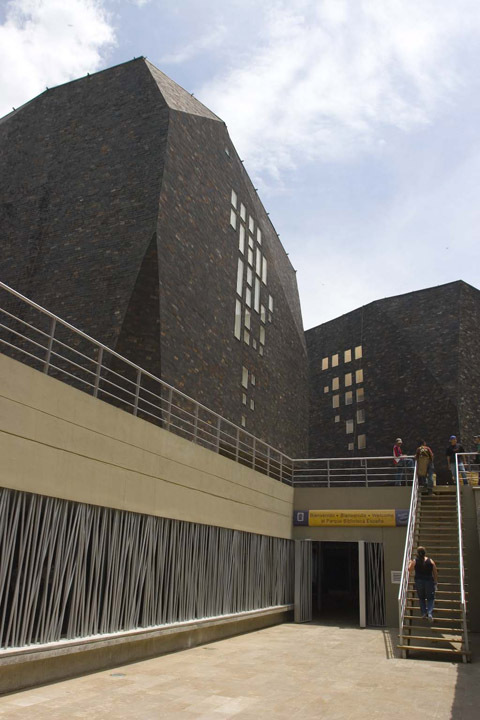 Filed under buildings we just love: Biblioteca Parque Espana by Giancarlo Mazzanti in Medellin, Columbia. The idea is brilliantly simple: create an artificial natural formation as a landmark for the city. The building is covered in a gorgeous dark stone that gives it the coloration of the surrounding mountains. There is also a wonderful public space surrounding the boulders, creating a true acropolis for this special site. The boulders frame the views, making the experience one akin to the view one gets after a long day mountain climbing. Tipped off (long ago) by Eikonographia.